Hundreds of millions of tons of plastic sit in our oceans, and we add millions more each year. That plastic never goes away or degrades; it just breaks into smaller pieces and becomes even more dangerous. Right now, much of that plastic is concentrated in a region known as the Great Pacific Garbage Patch, which currently contains some 350 million tons of trash. The Great Pacific Garbage Patch stretches over a vast area between the west coast of the United States and Hawaii. It is approximately twice the size of Texas, and it has been estimated that it contains somewhere around 1.8 trillion pieces of floating plastic. 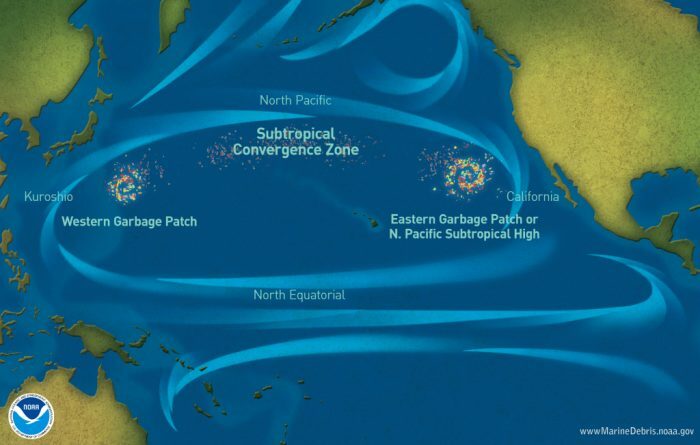 And remember, that is just one of the many garbage patches in the oceans of the world. Every year, 12 million tons more plastic garbage is added to our oceans, although that number will inevitably go up as our population continues to grow. Plastic waste washes from roads into culverts, to streams and finally rivers where it enters the ocean. Or it’s dumped over the side of ships or from sewers that feed directly into the sea. The trash enters the water from coastal countries, with the majority coming from Asian countries such as China, Indonesia, the Philippines and Vietnam. Developing economies that don’t have garbage and recycling programs that can keep up with their increasing use of disposable plastic are responsible for an outsized proportion of the trash that enters waterways, according to research published in the journal Science in 2015. Of course the U.S. needs to take a lot of the blame as well. We produce approximately 70 pounds of plastic garbage per person every year, which is the largest amount per capita on the entire planet. Over time much of the plastic is broken down into tiny pieces, known as “microplastic,” by the wind, waves and sun. These pieces can be the size of a fingernail to the size of a grain of rice, or smaller. Because they are made of plastic they will never decompose, only become smaller and smaller. This material is carried by global currents into one of the five “garbage gyres,” vast areas of ocean, sometimes hundreds of miles across, where slowly swirling currents gradually concentrate it into waters infected with a “smog” of micro plastic amid larger pieces and discarded nets, buoys and other industrial fishing gear. Marine life that comes into contact with this plastic can become entangled and cut by the larger pieces, or have their stomachs filled with inedible plastic as they mistake the smaller pieces for food, causing them to die of starvation because they can’t get enough nutrition. If we completely stopped putting more plastic into our oceans today, things would probably be okay. But if we continue on the path that we are on, we are truly going to be facing an apocalypse. The Ocean Cleanup is equipped with a 2,000-foot-long floating boom, which carries a large screen below to trap trash. Plastic trash will naturally pile up against that screen, making it easier for follow-up expeditions to clean it out. That is, assuming the device works as intended. There are plenty of questions surrounding this plan, such as how well the tubing holds up in storms, whether it can maintain its effectiveness over a period of months or years, and whether it has an impact on marine life. This upcoming test run, which is scheduled to last for the next year, is intended to answer these questions. Unfortunately, this will only clean up plastic that is right on the surface, and it will only make a very, very small dent in the overall problem. Once our oceans are dead, future generations will look back on us as “the crazy plastic people” that ruined the planet. We have got to stop being so selfish, and we have got to get things turned around before it is too late.